I’m standing just offstage, waiting for my big moment. I’m with my competition dance team. I’m really nervous, because I’m about to do a trick that I’ve never done before. The most complicated leap that my dance team, DanceStarz, has ever attempted! I whip off my pink, white, and gold dance team jacket, which only the five dancers on the select competition team get to wear. Underneath, my costume shined with thousands of tiny sequins, just like I was going to shine onstage! “You can do it, Harper! Love you, Harper!” My new teammates are encouraging, but I know they’re thinking the same thing I am: This is nearly impossible! How can a twelve-year-old pull off this stunt? My teammates run out on the stage and get into their positions. The music begins. Five . . . six . . . seven . . . eight . . . I run onto the stage, my head held high. I push off my left leg powerfully, and then stretch my legs out into a split. “Harper McCoy! Harper McCoy!” someone calls out from the audience. I smile my best smile, secretly thrilled I have fans out there who would call my name. I leap higher than I ever have before! I leap over my teammates, who are crouched down underneath me. I leap over Riley, over Trina—and even over Megan, who looks surprised that I made it. “Harper’s leaping! She’s leaping!” my teammate Riley whispers loudly. I am! I’m now leaping over Lily, my best friend on my dance team! And then my little sister, Hailey! And my dance teacher, Vanessa! Wait a minute. And then I leap over my dog, Mo! Why are my dance teacher and my dog onstage with me? I lose my focus and land on the stage. I fall forward flat on my face. I’m facedown! Everyone is laughing at me! Wait, sleeping? Not leaping? I opened my eyes and snapped out of it. I was facedown, all right—on my school desk. I lifted my head up to see my classmates looking at me and cracking up. Including Riley. “Harper’s sleeping!” Riley whispers even louder this time, and more people turn to look at me. Including my teacher. Oops. I hadn’t been leaping. I’d been sleeping. In my first-period English class. I slumped down in my chair. I could see Riley, a few desks over, cracking up with her friend. I’d been at my new school only a few weeks, and already I was embarrassing myself. Ugh. The rest of the class period I did my best to focus. However, I did yawn a few times when my teacher was looking the other way. After class was over, I went up to my teacher’s desk. I paused to take a breath. I knew I was babbling, and I just couldn’t stop. My teacher just waited. My teacher’s eyebrows shot up. “Basically, I’m tired. I’m really sorry I fell asleep,” I finished lamely. “Harper. Do you, by chance, do musical theater?” Mrs. Elliott asked me. When she nodded, before she could say anything, I went over to the front of the classroom. I took my prep and then held my plié for a second, making sure my technique was perfect. Then I pulled up, spotting six consecutive turns with a graceful landing. Nailed it! I posed and looked over at Mrs. Elliott, who looked equally surprised and happy. Wait, she was feeling the pressure? “I’m sure you’ve heard that the middle school play will be The Little Mermaid,” she continued. That wasn’t a punishment for falling asleep. I love The Little Mermaid. “In it?” I was totally confused. She lowered her eyes dramatically. A featured dance solo. A featured dance solo! I already had so much going on, but . . . The Little Mermaid would be so fun! It was one of my favorite movies. And getting picked for a solo without really having to audition felt really good. A solo that wasn’t going to be part of a competition. Plus, maybe it would be a chance to shine at my new school. Mrs. Elliott’s face lit up. With Mrs. Elliott thanking me profusely, I left the room to go to lunch. “Ack!” I bumped right into Lily. She was waiting in the hallway. She usually met me after English so we could walk into lunch together. 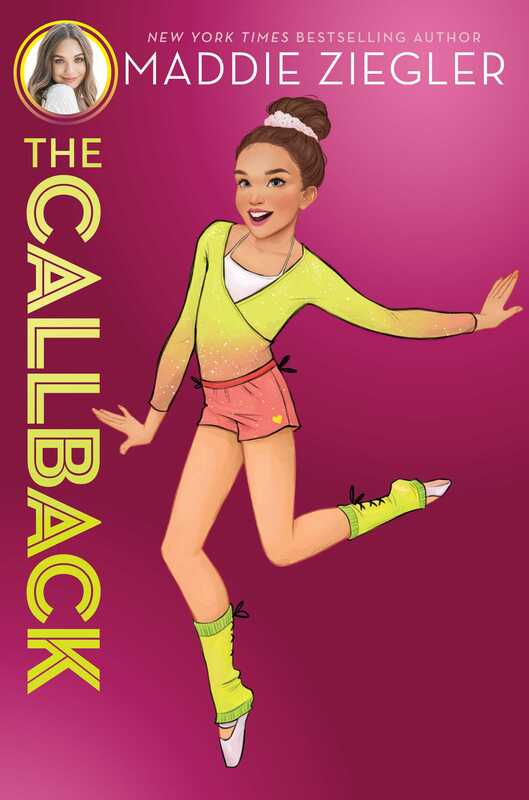 I’d met Lily the day of my DanceStarz audition, and I was happy she’d made the Squad too. And we went to the same school—so we were newbies there, too. We didn’t have any of the same classes, but at least we got to have lunch together. I lowered my voice into a whisper. I told her how Mrs. Elliot had asked me to be in the school musical. And how I’d said yes. “Harper, it sounds fun, but aren’t you already crazy busy?” Lily asked. “I love The Little Mermaid too,” Lily agreed—and then I realized something. Maybe Lily would want the chance to be in the musical, herself. I was happy the store was doing great. Lily moved here because her parents bought a really cute frozen yogurt store. It was right next to DanceStarz, which made it super convenient for us to go over after lessons. Lily’s parents even let me test out new flavors sometimes, like this berry hibiscus one I was now obsessing over. “Maybe that’s why the other dancer dropped out. She was like, I am not wearing an enormous clam,” Lily said. We both started laughing. I was still smiling when I walked into the lunchroom. We sat with Riley, who was one of the other three girls on our dance team. Our other teammates, Megan and Trina, went to our rival school. The three of them had been dancing together since they were little, and their nickname was the Bunheads. If you think it was hard being new in that situation—you’re right. Despite all that, at our first competition, we’d come together and come in third! I think we were getting along a little better outside of the studio too, which was nice. Riley was sitting with her friend Naima, who also went to DanceStarz and was on a different dance team. I put my lunch on the table and Lily and I sat down across from them. “Look who’s awake from her nap!” Riley laughed. “Huh?” Lily looked back and forth at us, confused. In the excitement of getting to do the solo dance in the play, I’d forgotten about the falling-asleep-in-class part. Ugh. “WHAT? I wasn’t drooling,” I protested as Riley and Naima were cracking up. “That is not what happened,” I assured Lily while pouring my granola into the yogurt a little too aggressively. Granola spluttered over the side. “How would you know that if you were asleep?” Riley asked. She had a point, but I did not even want to think about it. “And then Mrs. Elliott made her stay after class!” Naima said, like it was some hot take. “Harper, did you get in trouble? Did you get detention? She pulled out her phone to text the other two Bunheads and waved it at me tauntingly. Lily and I glanced at each other, but then had to look away so we wouldn’t crack up. “Sorry,” Riley muttered and shoved her phone back into her pocket. “Do you think you’re going to get the solo, Harper?” Naima asked me, totally putting me on the spot. “I . . .” Before I could come up with an answer for that, Riley jumped in. “Uh, not Riley!” Naima said, a little too cheerfully. Riley looked sadly at her hand. I did feel sorry for her. Her hand was definitely healing, but still not 100 percent. At our first competition, things had gotten a little stressful. The Bunheads’ former best friends, nicknamed “The Bells,” had joined a rival team, Energii. Right before DanceStarz was about to go on, there was drama and Megan had accidentally stepped on Riley’s hand. We had to change up our whole routine at the last second. Riley had healed enough for her to dance, but only as long she didn’t put pressure on her hand, which meant she still couldn’t do any of her show-stopping tricks she was known for, like her hand-walking and handsprings. Not to mention her jazz hands. Vanessa was going to assign each of us a solo dance we would work on ourselves. After we learned it, she would have us “audition” for the solo part in the next competition. Any solo you get to perform at a competition is a big deal. But this one felt even more special. Since the Squad was the first ever select team at DanceStarz, this would be the FIRST EVER solo in the entire history of the Squad. The person who got this solo would basically be making DanceStarz history! I wanted the solo really badly. Lily kicked me under the table, and then tilted her head toward the clock over the lunch table. 11:10! We had a tradition, ever since the first time we met. We both watched the clock until it turned. . . .
11:11—make a wish! I saw Lily close her eyes. I closed my eyes too and made a wish. I wished I would get the competition solo. I wondered if Lily was wishing for that, too.